Puntland's Dharoor and Nugaal/Nogal exploration blocks. In the 2000s, the Puntland government began official negotiations with foreign oil companies over exploration rights in the area. The provincial authorities in October 2005 granted Range Resources a majority stake in two sizable land-based mineral and hydrocarbon exploration licenses, in addition to offshore rights. 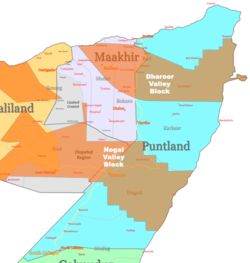 The onshore Nugaal and Dharoor Valley blocks in question span over 14,424 km2 and 24,908 km2, respectively. Two years later, Range Resources obtained a 100% interest in the two blocks and concurrently farmed out 80% of that share to Canmex Minerals. At the time of the 2005 agreement officially awarding the licenses to Range Resources, the Puntland government administered the entire Nugaal Valley. However, in 2007, troops from the separatist Somaliland region in northwestern Somalia were sent to the area and have since militarily occupied the valley's western section despite resistance from local residents. On account of the uncertain security situation in this part of the Nugaal block, Range Resources have as of 2011 given priority to drilling in the Dharoor Valley. In January 2007, the Puntland administration, which was then led by President Mohamud Muse Hersi, signed the Puntland Product Sharing Agreement (PSA) with Range Resources Limited and the Canmex Minerals subsidiary Canmex Holdings (Bermuda) II Limited. Under the terms of the both royalty-based and profit sharing agreement, Canmex would commit to two three-year periods of comprehensive oil exploration in the Nugaal and Dharoor Valley blocks. A 20-year period of exploitation would come into effect in the event of commercial oil yields, with an option to extend the duration an additional 5 years. Gross income would be allocated toward royalty payments, production costs and net profits. The royalty payments for produced crude oil would be deducted first and would be periodically issued to the Puntland government by the oil firms according to a sliding scale: 0-25,000 bopd=4.0% royalty; 25,000-50,000 bopd=5.0% royalty; 50,000-75,000 bopd=7.0% royalty; 75,000-100,000 bopd=9.0% royalty; 100,000 bopd and above=10.0% royalty. After these deductions, up to 70% of gross income would be earmarked for unrecovered capital, operating capital and operating expenses. The remaining gross income would be set aside for profit sharing, with 50% going to the Puntland government and 50% to the oil firms. Any future taxes levied on the petroleum activities would also be paid by the Puntland administration through its share of the oil profits. Following a change in leadership in 2009, the Puntland government, now led by President Abdirahman Mohamud Farole, sought to renegotiate the profit sharing agreement with Range Resources to ensure more favorable terms for the region. In 2012, the Puntland government gave the green light to the first official oil exploration project in Puntland and Somalia at large. Led by the Canadian oil company Africa Oil (the former Canmex Minerals) and its partner Range Resources, initial drilling in the Shabeel-1 well on Puntland's Dharoor Block in March of the year successfully yielded oil. 1 2 3 "2007 Annual Report" (PDF). Range Resources. Retrieved 14 July 2012. 1 2 3 4 "Oil and Gas Exploration and Production - Playing a Better Hand" (PDF). Range Resources. Retrieved 14 July 2012. ↑ "Leveraged to a Busy Drilling Program Through 2011" (PDF). Range Resources. Retrieved 14 July 2012. ↑ Mark Hawthorne (February 4, 2009). "You're not sacked, you've been realigned". The Age. Retrieved November 10, 2009. 1 2 Red Emperor, Range rally on Puntland drilling update. Proactiveinvestors.com (2012-03-07). Retrieved on 2012-05-20. ↑ Somalia: President Farole returns to Puntland. Garoweonline.com (2012-03-08). Retrieved on 2012-05-20.